In Judaism, wine or grape juice – the fruit of the vine – is a symbol of joy. We sanctify it with a blessing at every festive occasion: Shabbat, festivals, baby namings, and, of course, weddings, which are meant to be among the most joyous times of all. 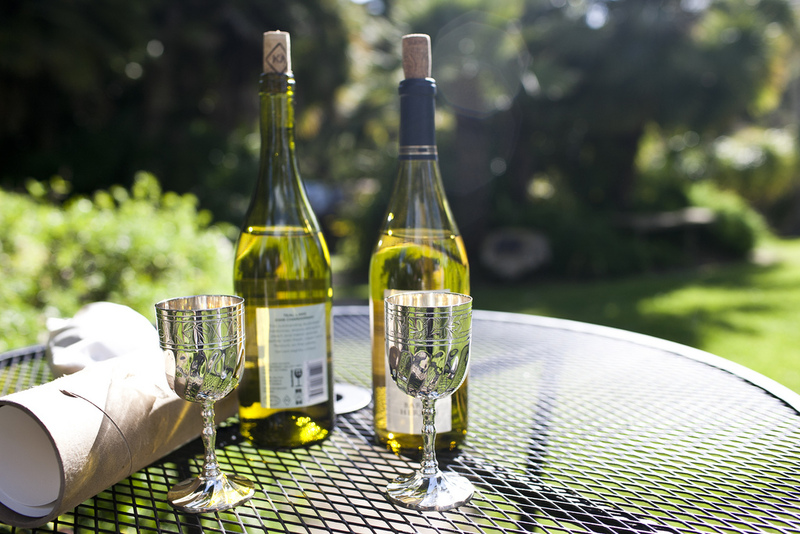 Beneath the chuppah, the marriage canopy that represents the home a couple will build together, we bless wine and the two drink from a shared cup, representing how they will drink from the same cup of life thenceforth. That was the first part of my divorce ritual that became clear to me: we would pour wine from a single cup into two, symbolizing that our portions in life are now separate. We no longer drink from the same cup. We no longer share life’s joys and sorrows. We do still share a child, and as co-parents to that child we will be connected for the rest of our lives, but each of us drinks now from a separate cup of grief or delight. Jewish tradition offers a kind of ritual for formally ending a marriage – the granting of a writ of divorce so that the partners may re-marry if they so choose. In the most traditional paradigm, the writ of divorce is granted by the man to the wife. Today in many egalitarian contexts, the divorcing partners (regardless of gender) write a document of release for each other. It’s a powerful tradition, but there isn’t much ritual to it. When I came to terms with the fact that my marriage was over, I knew I wanted a ritual to mark its ending. And I knew I wanted my ritual to involve more than simply writing the writ of release. The first piece I knew I wanted to include was the blessing of wine, and pouring that wine from one cup into two. I still have the silver goblet that we used as a kiddush cup at our wedding. It belonged to my father’s parents, once upon a time. Eighteen years ago it was engraved with our two names and we sipped from it beneath a chuppah made of flowers. It has been in a cupboard for a while – I have a new kiddush cup now that I use for Shabbat and festivals – but I brought it out again for this purpose. Holding the cup in my hand, I can remember how it felt to be twenty-three and embarking on the adventure of marriage. I can remember how it felt to be filled with hope for what I imagined that marriage would contain. I can remember how it felt to be certain that I would be partnered for the rest of my life. I can still find all of those feelings, if I reach for them. And now those old feelings are overlaid with the emotions of the last few years. I remember how it felt to hold that kiddush cup on the first Shabbat after I admitted out loud that I was unhappy. I remember how it felt to bless wine with that kiddush cup, week after week, as we threw ourselves into couples counseling. I remember the first Shabbat after we agreed that the marriage would end. His cup is no longer my cup. When his cup is filled with happiness, I will no longer have the opportunity to share it. When his cup is filled with bitterness, I will no longer create the opportunity to try to mitigate it. And when the wine of life that I drink is sweet now, it is not his to share but purely mine; and when it is salty with tears, the same is true. My challenge is accepting that and even learning to celebrate it, instead of only mourning the togetherness that I thought I would always have. There’s privilege encoded in that mourning. I’ve had the luxury of being partnered since I was seventeen. I knew that there was someone who was, at least in theory, dedicated to taking care of me. And that only intensified when I married at twenty-three. My husband was contractually obligated to care for me, and there was profound comfort in that. Now, in my forties, I need to learn what some of my friends learned twenty years ago: how to meet my own emotional needs. How to navigate the world alone. Of course on I’m not truly alone. I have beloved friends, I have a beautiful child, I have the companionship of the source of love and connection that my tradition names as God. But there’s a shift in consciousness: from “us” to “me,” from “ours” to “mine,” from “we” to “I.” From the shared cup, to the cup that is mine alone.